Buried Location / Memorial (P.O.W., D.O.W., K.I.A.) : TWEED HEADS LAWN AND GENERAL CEMETERY, NEW SOUTH WALES, AUSTRALIA. PORTION LAWN. 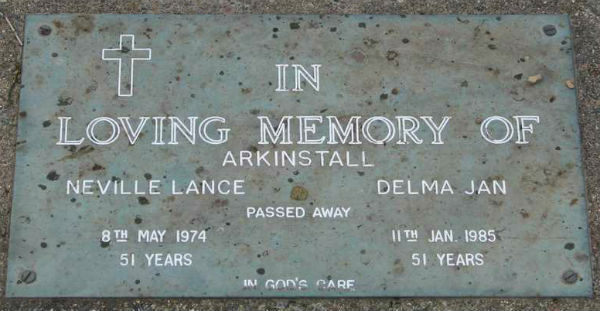 Background : Son of George Arkinstall. Husband of Delma Jan (died 11/01/1985 aged 51). Service & personal summary At enlistment : single. Previous military experience as Private in S.U.R. Bathurst unit as N275420. Blue eyes, sandy hair. Marks / scars : transverse scar inner aspect right forearm, oblique scar over base of right metacarpal, appendix scar (small superficial). 17/09/1943 Marched into Recruit Reception Depot Sydney, New South Wales. 22/09/1943 Special leave without pay from 0700 22/09/1943 to 0700 29/09/1943. 29/09/1943 Rejoined unit ex leave without pay. 05/10/1943 Marched out to Headquarters 3/5 Australian Infantry Training Brigade (Queensland Lines of Communication area). 06/10/1943 Marched from Recruit Reception Depot into 4 Australian Infantry Training Battalion Warwick, ???. 14/11/1943 Marched from 4 Australian Infantry Training Battalion into 15 Australian Infantry Training Battalion. 25/11/1943 Marched from 15 Australian Infantry Training Battalion into 33 Australian Infantry Training Battalion. 22/01/1944 Marched out to 1 Australian Infantry Special Group Number 7 Intake Intelligence Wing. 06/03/1944 Qualified at 1 Australian Infantry Special Group Intelligence Wing from 22/01/1944 to 06/03/1944. 06/03/1944 Marched from 1 Australian Infantry Special Group Number 7 Intake Intelligence Wing into 33 Australian Infantry Training Battalion. 05/04/1944 Marched out from 33 Australian Infantry Training Battalion to Australian Training Centre (Jungle Warfare) Canungra, Queensland. 07/04/1944 Marched from 33 Australian Infantry Training Battalion to 4 Australian R. (Recruit?) Training Battalion. 30/05/1944 Marched from 4 Australian R. (Recruit?) Training Battalion to 2/2 Pioneer Battalion. 02/06/1944 Taken on strength 2/2 Pioneer Battalion. 03/10/1944 Graded GP II intelligence duties. 16/03/1945 Embarked Cairns, Queensland on U.S.A.T. Sea Barb. 23/06/1945 Embarked Morotai on U.S.S. LST-703 for service in Balikpapan, Borneo. 10/10/1945 Taken on strength 2/33 Infantry Battalion. 12/01/1946 Transferred to New Guinea Details Depot (reposting). 12/01/1946 Embarked Balikpapan, Borneo on S.S. Taos Victory. 23/01/1946 Disembarked Rabaul, New Guinea. 29/01/1946 Initially marched out to 29/46 Infantry Battalion (changed). 29/01/1946 Marched out to 37/52 Battalion. 29/01/1946 Transferred into 37/52 Battalion from 8 Military District (New Guinea). 21/04/1946 Transferred from 37/52 Battalion to 22 Australian Infantry Battalion Rabaul, New Guinea. 26/05/1946 Transferred from 22 Australian Infantry Battalion to 26 Infantry Battalion. 30/06/1946 Transferred to holding strength Recruit Reception Depot & General Details Depot 2 Military District (New South Wales). 30/06/1946 Embarked Rabaul, New Guinea on H.M.A.S. Kanimbla. 05/07/1946 Disembarked Sydney, New South Wales. 05/08/1946 Marched out to Recruit Reception Depot & General Details Depot Queensland for disposal by 1 Military District (Queensland). 06/08/1946 Marched into General Details Depot 1 Military District (Queensland) for disposal. 19/08/1946 Detached to Typing School 1 Military District (Queensland). 23/09/1946 Marched in for detachment to 1 Military District (Queensland) (Typing School). 26/09/1946 Marched in from Recruit Reception Depot & General Details Depot 1 Military District (Queensland). 08/11/1946 Transferred to Recruit Reception Depot & General Details Depot 1 Military District (Queensland) for discharge.